While we love to brag about the results our customers get with Diamabrush, we are just as pleased to share their jaw-dropping savings over other options. 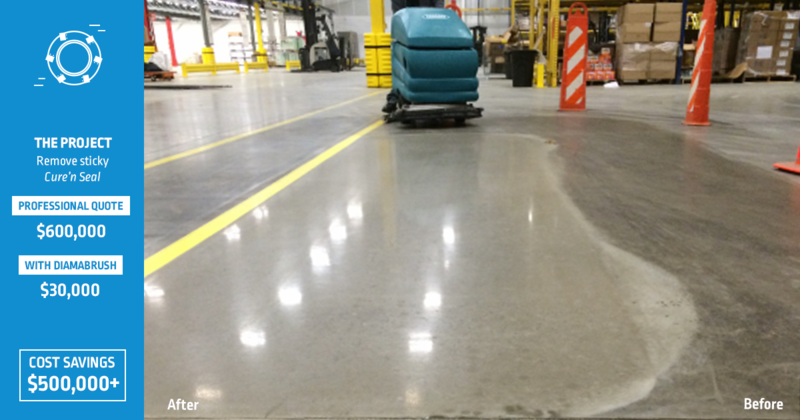 Case in point: a tractor parts distributor, boasting over 1,000,000 square feet in their Georgia facility, wanted to remove sticky Cure n’ Seal that was retaining dirt and tire marks from forklift traffic. They also wanted to elevate its look by giving it a high-gloss polish and to make it more slip-resistant. They initially sought a bid from a flooring contractor. The quote they received exceeded a whopping $600,000. Then the supply company heard about the versatility of the Tennant T20 machine and the power of Diamabrush polishing tools. Seeing the results other customer got, the supplier decided to bring the work in-house as part of their existing cleaning routine. They bought the Tennant machine for about $50,000, along with Diamabrush polishing tools at $30,000. In other words, this customer was able to save over $500,000 by going with Diamabrush. (That’s not to mention the potential energy savings from a brighter workspace). Talk about a no-brainer decision!